Sin City might not seem like a good choice for a family vacation. But it has more attractions and entertainment for the whole family than any other city in the US besides Orlando. 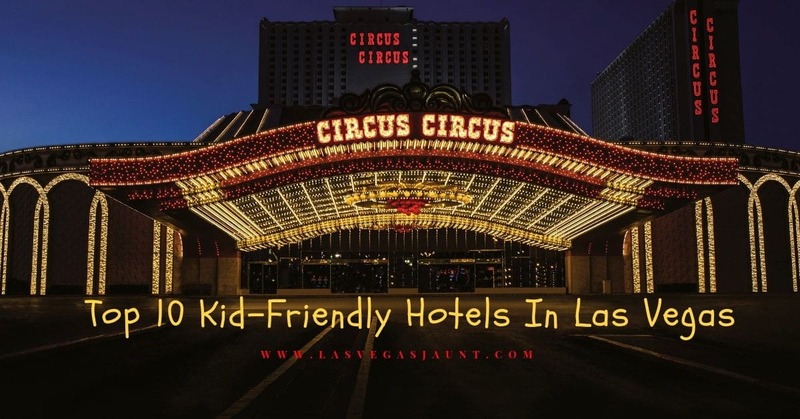 Here is a list of 10 kid-friendly hotels in Las Vegas for your to consider. 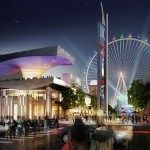 The Mirage is one of the best Vegas hotels for kids. The tropical-themed resort boasts waterfalls and greenery both inside and out. The kids will think you're in some exotic destination. Inside, there's a 20,000-gallon aquarium that is home to tropical fish, stingrays, and other marine life. There is lots of family-friendly entertainment on site, such as puppeteer Terry Factor and Beatles Love by Cirque du Soleil. Make sure to check out the animals at Siegfried & Roy's Secret Garden and Dolphin Habitat. The whole family will love the volcano eruption on site each night at the hotel. It erupts nightly starting at 8 p.m. with a soundtrack, 150 fire shooters and a grand finale shooting 60 feet into the air. Don't miss it! You'll love the 24-hour restaurant The Pantry for when kids get hungry in the middle of the night. Kid fare is also available at California Pizza Kitchen, Carnegie Delicatessen, and Paradise Cafe. The Mirage also features beautiful outdoor pools set between waterfalls and palm trees. The Mandalay Bay sits on the South side of the Las Vegas Strip. This resort features an incredible 1.6-million gallon shark aquarium. Besides 20 species of sharks, it also has sea turtles, sawfish, moon jellies and giant rays. Kids can feed turtles, sharks, and stingrays. The outdoor pools include a wave pool, a beach with real sand and a quarter-mile long lazy river. Mandalay Bay is one of the most popular kid-friendly hotels in Vegas. Kids have their choice of food at the 20 on-site restaurants. After dinner, head over to see Michael Jackson's ONE by Cirque de Soleil. The Venetian is a popular themed hotel located on the north end of the Strip. The opulent Italian design is in every detail from hand-painted murals on the ceilings to huge marble art pieces. Your whole family will love strolling through the Grand Canal Shoppes which is a replica of Venice. Enjoy food and shops along the way. You can even pay to hop in a gondola and take a ride inside the hotel. The luxury suites are nearly double the size of other hotel rooms. This 5-star hotel features spacious rooms that are 650-square feet. Pull out the sofa bed for the kids in the sunken living room and enjoy some privacy in the bedroom or Italian marble luxury bathroom. Treat your medieval-loving children to a life like a king in a castle. Your family will love the Tournament of Kings dinner show which includes jousting. Excalibur also features a 15-minute 4D show. The Fun Dungeon is a huge arcade that the kids will never want to leave. Enjoy Dairy Queen and Orange Julius on the same level for a snack between games of Pacman. There are lots of room styles to choose from so that you can find the right accommodations for your group. Picky eaters are sure to find something to enjoy at the buffet, Johnny Rockets or in the 24-hour food court. Who doesn't want to stay in a hotel called the Golden Nugget? Kids will want to ride the 3-story water slide that swoops through a shark tank again and again. The arcade and outdoor light show are also kid-approved activities. Typical kids fare is available at the Grille. Yes, they even serve chicken nuggets. Can't get enough of the Greatest Showman? Circus Circus is a magical resort for kids and kids at heart. Each day you can enjoy the daily free circus inside the big top. Enjoy the on-site giant 5-acre theme park, midway full of carnival games and big stuffed prizes. The water park and spray pad has something for toddlers up to thrill-seeking teenagers. 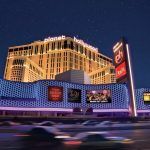 If you prefer family friendly hotels in Las Vegas that are away from most of the action, choose the north end. 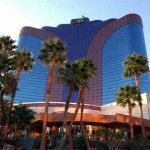 The Hilton Grand Vacations Suites is great for people who want to enjoy the attractions in Las Vegas but stay away from the casinos. This hotel has a great shallow pool ideal for youngsters as well as a spray pad. There are also various sports like basketball and volleyball. The game room features ping pong, foosball and billiards. Choose from 1 or 2 bedroom suites perfect for families. You get 2 TVs, Wifi, HBO, a full kitchen and separate dining area and a living room. If you want to stay somewhere off the strip, South Point is one of the best Vegas hotels for kids. You'll all enjoy the bowling center, the arcade and the movie theatre featuring 16 screens. The pool area is kid friendly. There's a great variety of restaurants to cater to your kids including the Garden Buffet. Choose from 6 live cooking stations or customize your own creation at the Mongolian Grill. Opt for a junior suite with 1 or 2 bedrooms so that you don't have to go to bed when the kids do. This resort is just 2 miles south of the Las Vegas Strip. It features an incredible family pool with a sandy beach entry, lazy river and gorgeous fountains and waterfalls. Make sure to warm up in the kid-friendly hot tub. Help yourself to one of the gas grills and tables all over the pool complex. Each night enjoy a traditional luau. This popular Polynesian show features hula and fire-dancing. It's dinner and a show and no Hawaiian shirt required. Tahiti Village Resort is close to outlets, shopping and lots of restaurants and is one of the top family-friendly hotel in Las Vegas. Cancún Resort is a great Mayan-themed non-gaming Vegas hotel just a few miles south of the Strip. The pool area features an impressive Mayan temple with a cascading waterfall. Enjoy the 2 pools, 4 waterslides and a jacuzzi under the waterfall. There's also a games room with foosball and other kid-favorites. The apartment style rooms have kitchens and living rooms as well as individual patios. You can even get groceries delivered to your room and save yourself a trip to the store. 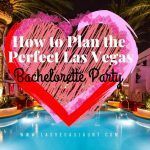 Las Vegas is more than just casinos and adult-themed nightlife. Las Vegas caters to tourists of every kind, even families. 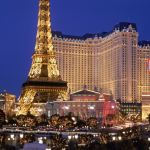 We hope this list of kid-friendly hotels in Las Vegas has helped you choose the perfect resort to make your stay unforgettable. 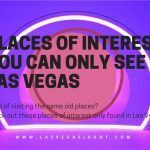 Check out these discounted Las Vegas attractions during your stay!